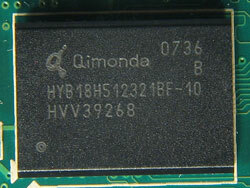 Dynamic random access memory is the most used form of RAM. DRAM is called dynamic (or active), because it must be refreshed all the time or it will lose the data which it is supposed to be storing. That is why it is called “volatile”. If something is volatile, it runs away quickly. Refreshing DRAM means reading the data from the DRAM and directly writing them back to the DRAM. DRAM is made up of millions of very small capacitors. Each of these capacitors has a transistor to let energy in and out. The capacitor slowly loses energy, and if the DRAM is not refreshed, in the end one or more of the capacitors will let so much energy out, that for example a 1 will become a 0, so data will be lost or corrupted. Almost all computers refresh their DRAM many times per second. DRAM is often compared to SRAM (Static RAM). SRAM is able to store data as long as power/energy is used. There is no need to refresh it. SRAM can also be faster than DRAM. But SRAM is much more expensive than DRAM. Also, SRAM uses more electric power and heats up much faster than DRAM. DRAM and SRAM lose the data when the power to them is turned off, unlike non-volatile random-access memory. Writing to a DRAM cell. The principles of operation for reading a simple 4 by 4 DRAM array. Basic structure of a DRAM cell array. Common DRAM packages. From top to bottom: DIP, SIPP, SIMM (30-pin), SIMM (72-pin), DIMM (168-pin), DDR DIMM (184-pin). A pair of 32 MB EDO DRAM modules. Dynamic random-access memory Facts for Kids. Kiddle Encyclopedia.